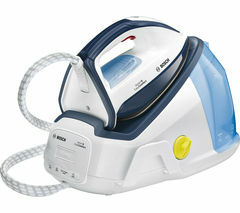 Iron out the creases and take the hassle out of laundry days with a high performance Bosch iron! Our selection of irons includes products from a whole host of leading names including Philips irons, Morphy Richards irons, Russel Hobbs irons, Tefal irons, Bosch irons, and more. From steam irons to steam generator irons, our extensive range of Bosch irons is sure to meet all your domestic ironing needs. With innovative features such as CeraniumGlissée soleplates and DripStop functionality, Bosch irons will glide over your clothes for effortless ironing. Our extensive range of Bosch irons includes the Bosch TDA5072GB Steam Iron, the Bosch Sensixx TCA5070GB Steam Iron, and many more. 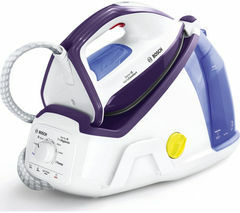 If you’re looking for an advanced steam system to quickly and easily refresh your fabrics, check out the Bosch Steam Generator Sensixx B35L with its Calc’nClean technology, or the Bosch TDS3872GB Steam Generator Iron. Our Bosch irons are available in a range of attractive colourways. From classic white and silver, or white and blue, to metallic grey, black and ice blue, to white and violet, there’s sure to be an option to suit your personal preference and sense of style. For more high quality irons, check out our range of Tefal irons where you’ll find a variety of steam irons, steam generator irons and garment steamers.